The Gazco Logic HE Winchester Balanced Flue is a glass fronted gas fire that will give your home a warmth and cosiness. 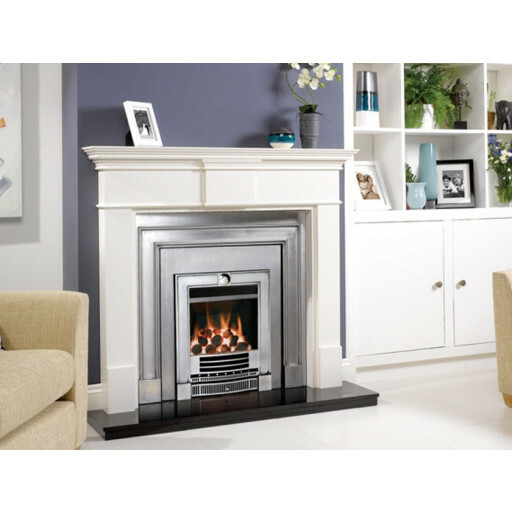 The gas fire is high efficiency and gives a maximum of 4.5kw of heat, which is 89% efficiency. In residences without chimneys, the heat output is 3.4kw and the efficiency is 86%. The Logic HE Winchester fits in a standard fireplace opening of 16 by 22 inches on an external flat wall. It does not need a flue or a chimney to work. You can customise your fire with the option of black, chrome, and brass trim colours, providing you with the flexibility required to ensure that your new gas fire compliments the décor of your room. Additionally you can also choose either tiny white pebbles or the classic coals inside the gas fire. Not only is this gas fire stunning in its appearance, but the choice of control options also makes it extremely practical for people who may struggle to get down to light he fire. Additionally you can choose between either a natural gas or LPG burner when ordering this fire. This modern designed balanced flue gas fire made by a British manufacturer and comes with a 5 year warranty as standard. Stunning looking fire,definitely worth the extra money compared to other balanced flue fires out there. needed a new balanced flue high efficiency gas fire to replace my existing old model visited the fireplace warehouse fireplace shop on Accrington road in Burnley and was recommended to purchase the Gazco Winchester High efficiency fire which was demonstrated by a very helpful member of the sales team and was so impressed purchased one of them immediately.